Hey everyone. Waiting on Wednesday is a weekly event hosted by Breaking the Spine. Its purpose is to highlight upcoming releases we’re dying to get our hands on. When sixteen-year-old Alice is diagnosed with leukemia, her prognosis is grim. To maximize the time she does have, she vows to spend her final months righting wrongs—however she sees fit. She convinces her friend Harvey, whom she knows has always had feelings for her, to help her with a crazy bucket list that’s as much about revenge (humiliating her ex-boyfriend and getting back at her arch nemesis) as it is about hope (doing something unexpectedly kind for a stranger and reliving some childhood memories). But just when Alice’s scores are settled, she goes into remission. Now Alice is forced to face the consequences of all that she’s said and done, as well as her true feelings for Harvey. But has she done irreparable damage to the people around her, and to the one person who matters most? 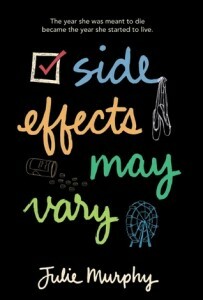 Julie Murphy’s SIDE EFFECTS MAY VARY is a fearless and moving tour de force about love, life, and facing your own mortality. 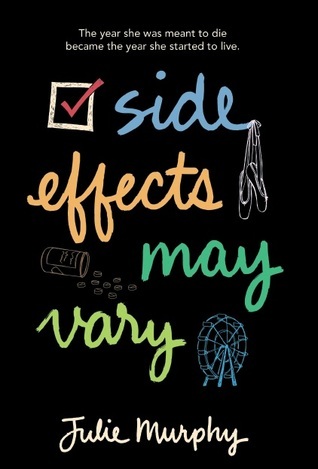 Side Effects May Vary sounds so amazing, I can’t even! She has to face the consequences of her Bucket List? Who ever thought that would happen?? I’m excited to see how this goes! I read it in December and overall I really enjoyed it.It was really good and I was glad I gave it a shot. Hopefully you can read it soon. That’s awesome! I’ve heard such wonderful things about it! Can’t wait till it releases!